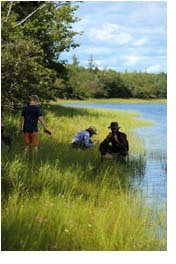 Species at Risk conservation and recovery is an important component of the Biodiversity Program within the Wildlife Division of the NS Department of Lands and Forestry (NS DNR). Species at risk include any plant, animal, or other organism that is seriously at risk of extinction. A current list of species at risk protected under the NS Endangered Species Act can be viewed on this website. The status of wildlife species are determined through both a provincial and national status assessment process. Species listed through the provincial process, by the NS Endangered Species Working Group, are then legally protected under the NS Endangered Species Act (NS ESA). Species listed through the national process, by the Committee on the Status of Endangered Wildlife in Canada (COSEWIC) are protected under the federal Species at Risk Act (SARA). Once a species has been assessed, and legally listed, a recovery team is established and recovery and conservation efforts are initiated. For species listed under the NS ESA the conservation and recovery of species at risk is coordinated by the Wildlife Division of NS DNR. There is also a provincial General Status assessment process which serves as a first alert tool for identifying species in the province that are potentially at risk.